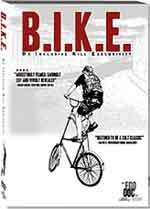 B.I.K.E. is probably the closest to an “insider” look at the infamous Black Label Bike Club, an anti-consumerist group of pro-bicycle culture anarchists, that’s going to be made. There are different factions all over the country, but this film is primarily about the Brooklyn chapter and one dude’s efforts to gain entry. It’s a very closed-off, secretive group in which prospective members have to go through a lengthy try-out period. There’s no set criteria to becoming a member, but if you want to join and hang out with them enough and they eventually “trust” you, then you’re in. Anthony Howard is the main guy here trying to join the Brooklyn Black Label and he’s also the co-director of the film. While Howard is in just about every frame from beginning to end, Jacob Septimus is the other co-director and he only “appears” as the disembodied voice of the dude holding the camera. It’s also not very clear if Howard is just going through the induction process for the movie or if he’s a genuine bicycle enthusiast. Although it does come across, even if it’s never quite stated explicitly, that Black Label isn’t sure of Howard’s motives either, so they give him a hard time. But then kind of a weird thing happens. Howard spends months with these guys, goes to a lot of their meetings as such, attends their events, hangs out with the Black Labelers constantly. But they don’t let him in. When you get to see Howard’s antics, you kind of understand why the Labelers wouldn’t want him. But nobody ever tells him to go away. Once he’s rejected the first time, why do they let him continue to hang out? And why the hell does he even still want to join? Just to get a good ending to the film? But at that point, the movie stops being about Black Label and ends up a psychological study of Howard. I won’t give away the ending here. I won’t say if the movie is ultimately a triumph over adversity, about a man who figures out his faults, overcomes them and triumphs by becoming the kind of person who is accepted by the society he so desperately longs for. Nor will I say if Howard stays the perpetual outsider, the man accepted, nor rejected by anybody. This all adds up, though, to quite a complicated documentary mainly because it’s not easy to peg down the motivations of any of the characters. I’m not sure how I feel about Black Label personally. One the one hand, I dig their message of being anti-automobile and carbon emissions, but their methods are suspect and they seem to really just be about hanging out and having a good time. They want to promote an anti-consumerist lifestyle, but I didn’t see any proactive, sustainable ways they attain their goals. For example, it’s one thing to go dumpster diving for vegan meals and living on society’s excessive waste and it’s another to sustain yourself by growing your own food. And as much as Howard is in the film, I never really felt like I “knew” the guy. He doesn’t come off as a sympathetic character at all. We meet his parents a few times and he seems like he comes from a nicely affluent home, yet he acts as if he’s tortured by all these personal “demons” that only seem to be troubles of his own devising. When he gets drunk and starts fistfights for no reason, it’s hard to feel warmly towards him. But it’s because of all of these unexplained, un-reduced-to-a-soundbite issues going on that makes B.I.K.E. a rich, engaging experience.